Barbed Wire Reef owner Rico Aragon stands at the future site of the brand’s first brick-and-mortar restaurant. The restaurant will be located at 4499 W. 38th Ave., in a former auto repair facility. Photo by Thomas Gounley. A food truck operation that specializes in exotic meats – including camel, wild boar and kangaroo – is adding a brick-and-mortar location. Barbed Wire Reef leased 3,000 square feet at 4499 W. 38th Ave., just west of Tennyson Street in the Berkeley area. Owner Rico Aragon hopes to open in early fall. “I was looking for one of the up-and-coming neighborhoods, either RiNo, LoHi or Berkeley,” Aragon said. The building, a former auto repair shop, is being repurposed now. Barbed Wire Reef will take up half the structure; Aero Craft Brewing has leased the other side. Aragon said he owned a wild game restaurant called Saltwater Cowboy in the Vail area before moving to Denver in 2010. 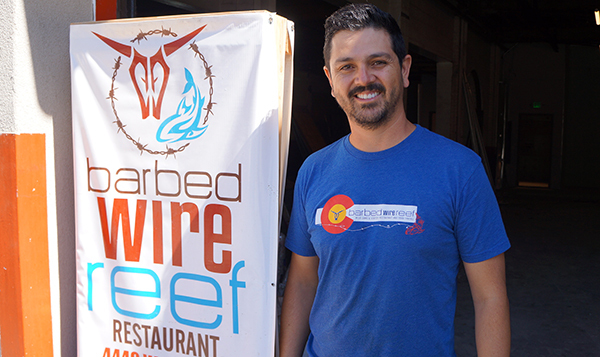 In 2011, he started Barbed Wire Reef as a food stand at special events. The next year, he turned it into a food truck. “I wanted to stick with the same concept because I really believed in it,” he said of the focus on wild game. Aragon added a second food truck in 2014. He made one prior run at opening a permanent location. In 2015, he signed a lease a space in the Highlands. But Aragon said the development, which he declined to specify, kept getting delayed, and he ended up backing out. He said he took about a year before restarting the search for a new spot. The restaurant on 38th Avenue will have indoor seating for 100. A large patio will be able to fit another 40, Aragon said. It will be open for lunch and dinner seven days a week, with brunch offered on the weekend. The menu will match what’s been offered on the food trucks for years. Aragon said the most popular items are the chipotle BBQ pulled wild boar sandwich and the blackened Ahi tuna sandwich. The restaurant will have a full bar. Aragon said his food trucks have been stationed at local breweries for years, and the menu will suggest beer pairings with particular dishes. “We’ll be supporting them back and selling their products,” he said. Aragon estimated it will take about $500,000 to get the restaurant up and running. Another permanent location could be on the way. Aragon said he’s negotiating a lease for a spot in Edgewater. And the brand still will have a strong food truck presence, adding a third one later this year.